MANSFIELD, Mass. 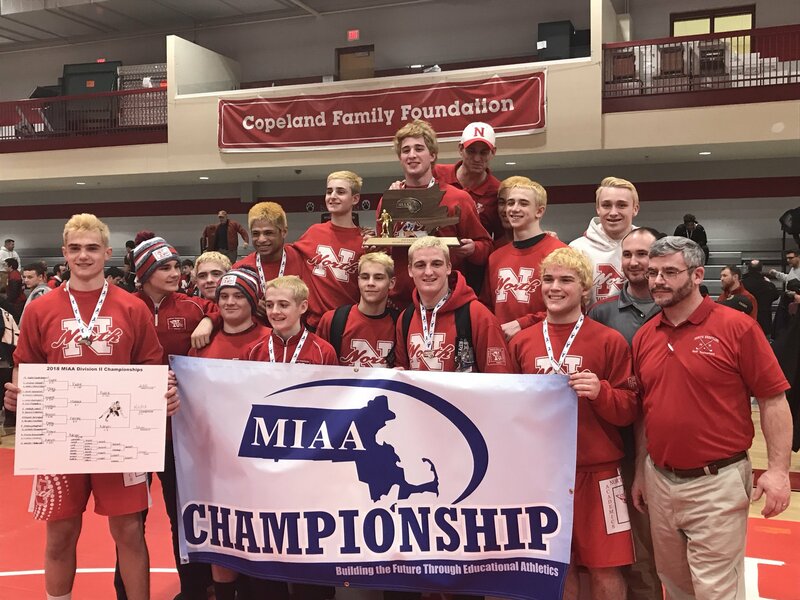 – On Wednesday, the Panthers were recognized for their impressive season, which includes only one dual meet defeat to Marshwood (Maine) in a tournament in Merrimack, N.H. over the weekend. Mass Wrestling named Franklin the top team in the state, across all divisions, and the Panthers went out on Wednesday night against Mansfield in the James Albertini Gym and showed why they are so highly regarded. Franklin won the opening eight weight classes of the dual meet, four of them by pin and another by tech, and lost only two of the 14 matches on its way to a comprehensive 59-8 team victory. 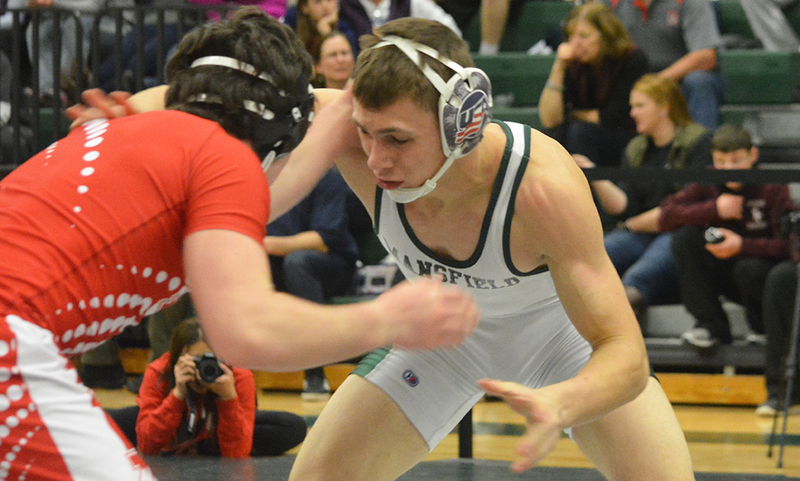 With King Philip losing to Oliver Ames in another of Wednesday’s dual meets, the Panthers also clinched at least a share of the league title with one dual meet remaining. Jordan Carlucci set the tone with a quick first round pin at 106 pounds and Ian Bakalars (113) followed with a pin in the second round. Mike Racca made quick work of his opponent at 120 and gave the Panthers a dominant 18-0 start. 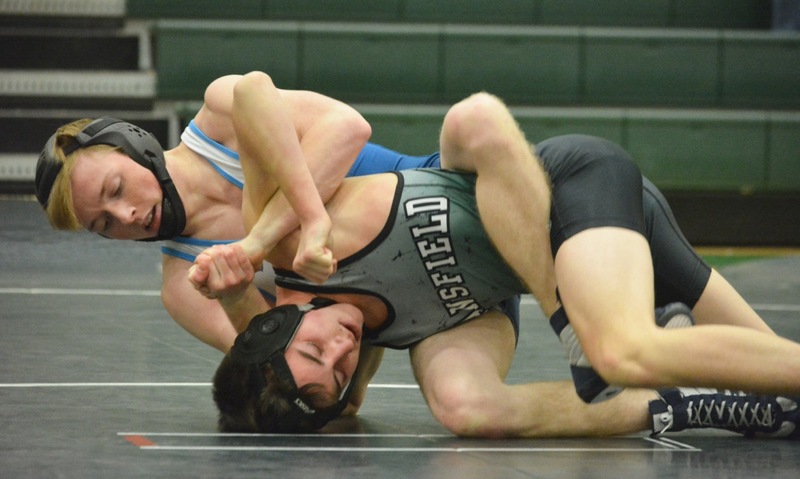 T.J. Remillard scored four points in the opening round of his match against Will Stratton at 126 and, as much as the Mansfield grappler tried to find a way to score, held on for a 4-0 win. Brian Farrell followed that with another strong performance at 132 to pick up the 15-0 victory and five points for the Panthers. 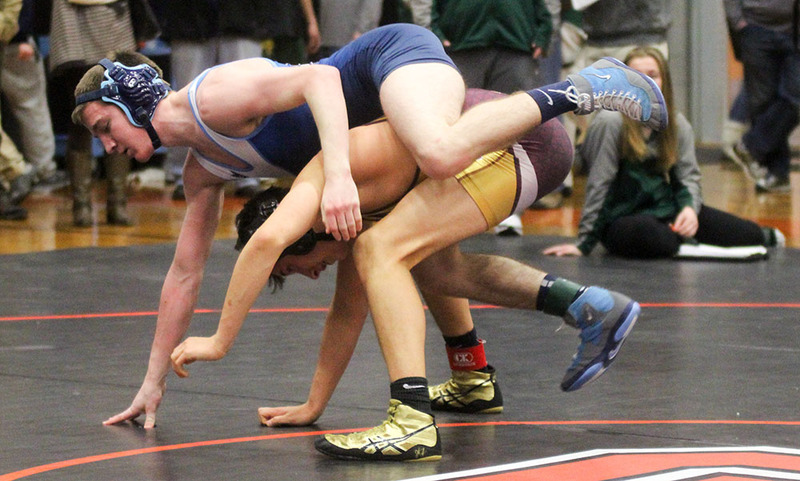 Tom Zogby had a second round pin at 138 and Dylan MacLean got a very quick pin at 152, but in between at 145 was one of the matches of the night between Caleb MacLean for Franklin and Mansfield’s Ciaran Connolly. MacLean took a 2-0 lead into the second round and regained the lead with a takedown after Connolly’s reversal knotted up the scores. The final round was the loudest that the crowd and the two benches got (by far) as Connolly pulled even again with another reversal and looked like he might have the upper hand in the match, until an escape inside the final 15 seconds earned MacLean a hard-fought 5-4 win. Mansfield coach Mark DiSanto wrestled against Collace and Franklin during his high school career, so he knew what to expect from the Panthers on Wednesday. Jayden Curley got Mansfield its first points of the night with an 8-2 win at 161 pounds and then freshman Vinnie Holmes continued his stellar rookie campaign with a 17-1 tech at 170 that made the score 41-8. 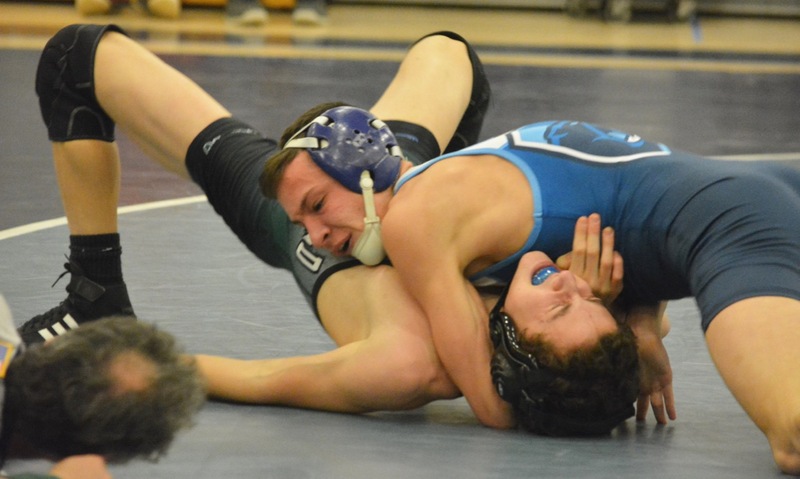 Evan Hernandez and Bruce Johnson had back-to-back pins for Franklin at 182 and 195 and Jack Coughlin came from behind with five points in the third round to beat Ford DelVecchio at 220. Brian Perry closed out the dual meet with a 12-5 win at 285, capping off an impressive night for the Panthers. Mansfield took home the team title at the Cape Cod Invitational over the weekend and DiSanto is counting on that to carry over into this weekend’s league meet.